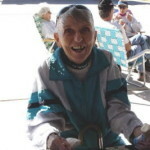 Gurnelle Jones, initiator of the Annual New Years Day PPP Usery Park potluck. 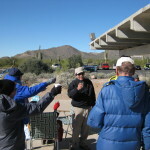 When I arrived at the Usery Mountain Regional Park for the 2015 version of the New Years Day Pinnacle Peak Peddlers potluck at 9:00 A.M. the thermometer registered 34º. When I left at 1:15 P.M., the thermometer showed 42º. What transpired in that 8º window? First order of business, get that 40-cup coffee pot perking. Set out all the utensils and plates. Cups for not only coffee, and cocoa, but champagne with which to toast the New Year are set out. Thereʼs a table for hot dishes, a table for desserts, and several tables for socializing. People start to arrive with food, chairs, and blankets. Since I was nursing a cough and sneezes, I brought my heater and a heating pad. Considering Arizona weather, I layered because certainly I assumed Iʼd get too warm with a cotton turtle neck, a wool vest, a wool sweater and a rain jacket. NOT! 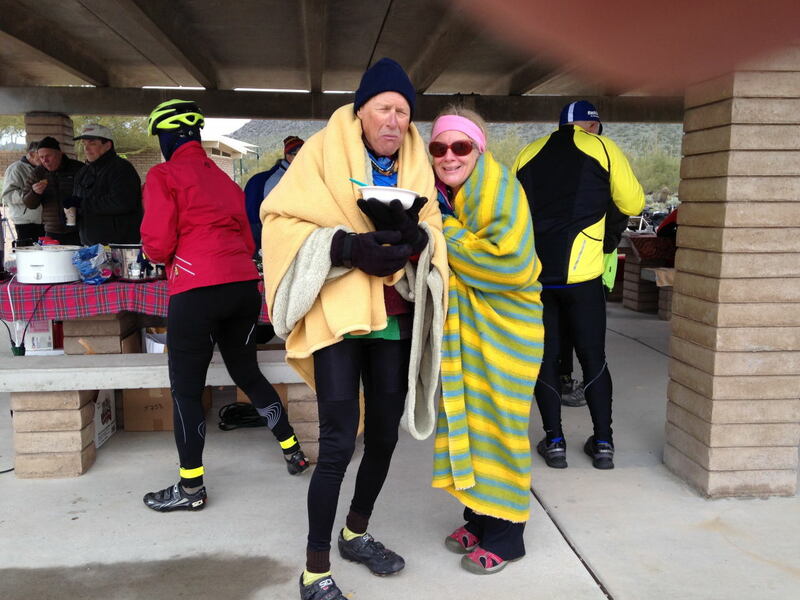 I appreciated my wool socks and all the other trappings that I hauled out there. At the close of the 19th Century, Dr. Walter William Jones, a physician-rancher, ran cattle from the Lower Salt River to the foothills of Four Peaks. “Butcher” was a common nickname for physicians during this period. 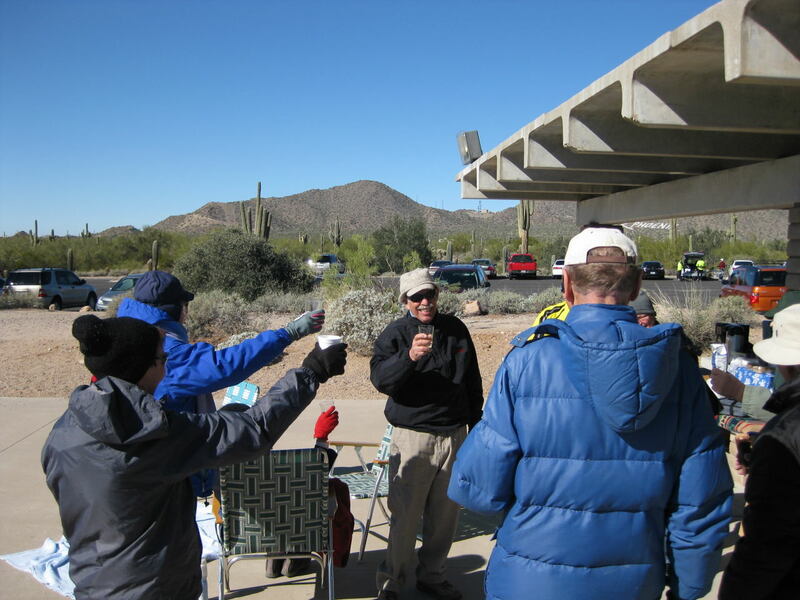 After the Stewart Mountain Dam was completed and Saguaro Lake filled in 1930, a cove and beach were named “Butcher Jones” by those who remembered the good doctor. “Usery” comes from King Usery, who had a ranch around there at the same time. Jack Stewart also ranched the area, apparently just after Jones and Usery. 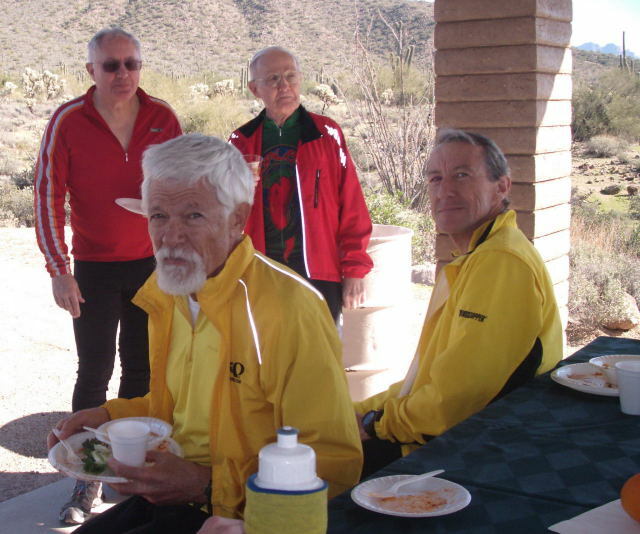 As Waltʼs group returned and cyclists biked in from Sun Lakes and Tempe, the socializing began in earnest. 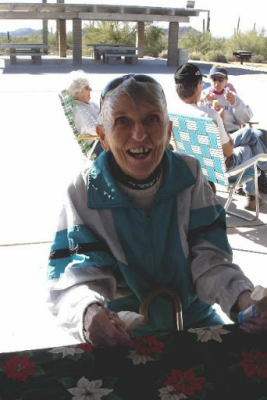 No one had to be called twice for food–hearty chili and other nourishing hot food. 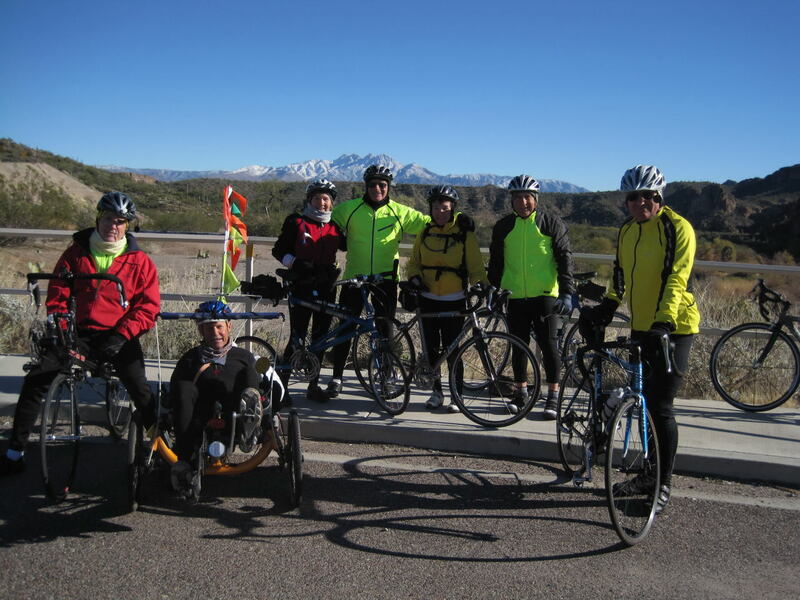 A new feature of the gathering this year was a collection of bike clothes and bike parts that have been sent to Lon Haldeman of PAC Tour who for the last decade has nurtured biking in S. America and Africa as well as furnishing books to orphanages and building schools in Lima, Peru. This is how Lon describes the events: “For the past five years the racing club in Lima, Peru has been organizing a two-day-stage race in the northern part of the city. 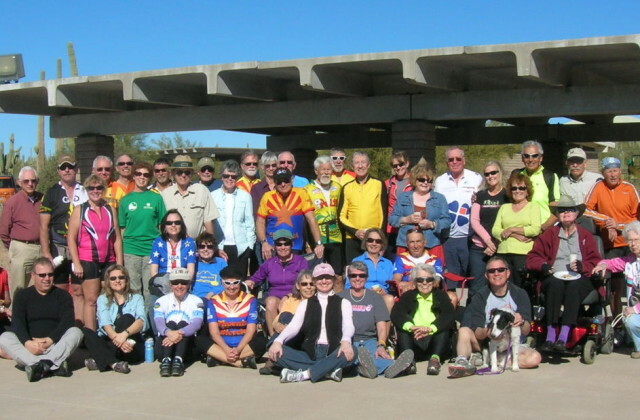 The reason it is called the Gringo Race is because all the prizes have been donated by PAC Tour riders and other American cyclists. This race has the best prizes of any event in Peru. We will take over 250 jerseys, shorts and various cycling supplies to Peru. 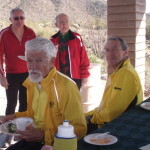 The first stage is an 80 KM road race through the desert sand dunes. The next day is a 20 KM criterium through the small streets of the town of Puente Piedra. 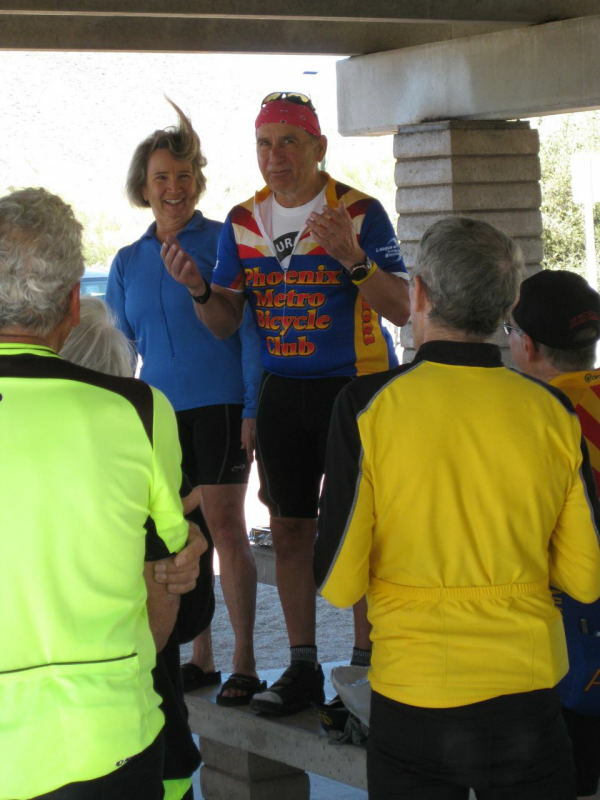 There will be about 200 riders in various age groups attending the races”. This year on New Years Day, we collected many items including a dozen bike shorts, forty-three jerseys of all kinds, four helmets Trek, Giro, etc., shoes, 6 pair, socks, some never worn, 9 jackets, some light, some heavy, seven tubes, a box of water bottles plus, several Camelbacks, bike bags and fanny packs and bike parts to use for repair It cost $195 to ship three boxes all from donations. Within days, the reservation for the next annual PPP potluck are made by Walt.